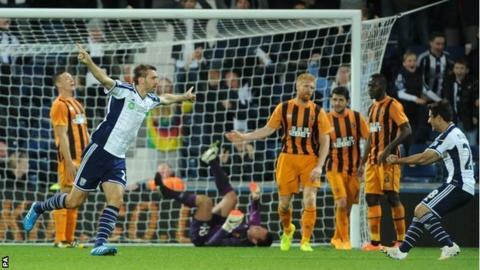 West Brom scored two goals in the last four minutes to overcome Hull in the Capital One Cup third round. The Baggies' £10m record signing Brown Ideye poked in before Tom Ince smashed home an equaliser. Robbie Brady latched on to a Hatem Ben Arfa through-ball to put Hull in front but the tables were turned in a dramatic finale. Centre-half Gareth McAuley volleyed home an equaliser from 10 yards and Saido Berahino slotted the winner. Liam O'Neil, Sebastian Blanco and Cristian Gamboa all made their full debuts in a West Brom side showing several changes from the one that beat Tottenham 1-0 at the weekend. The hosts took the lead on 15 minutes when O'Neil's cross landed perfectly for Blanco. He was denied from point blank range by Steve Harper, only for Ideye to stab in from two yards. The Nigeria international injured himself in scoring the goal and had to be replaced by Georgios Samaras. Hull turned the game in the space of 10 minutes either side of half-time. Yannick Sagbo found Brady scampering down the right and he crossed for the unmarked Ince to score at the far post. Five minutes into the second half, Ben Arfa wriggled inside from the wing and split the Baggies defence with a pass, which allowed Brady to collect and find the corner of the net. Hull were inches away from adding to their lead when David Myler's volley arrowed wide before Albion began their late rally. Harper denied Claudio Yacob and Berahino but could do nothing to stop McAuley's crisp volley through a crowd after Hull had failed to clear a corner. One minute later, Silvestre Varela slipped the ball through to Berahino and the England Under-21 squeezed it past Harper from a tight angle to set up a last-16 tie away to Bournemouth. "Brown Ideye has rocked his ankle when he scored so it was a bitter-sweet moment. "On one hand he scored, on the other he had to go off. He'll be happier because the pressure goes on strikers when they don't score. "He shows in training he's a good finisher and it was a shame he had to go off but I don't think it's too bad." "We are really close to having a really good team and a really good squad. It's frustrating, as you can imagine. "With three minutes left you are thinking 'I'm going to leave this alone'. "We were so comfortable you are thinking it's going to be us to score another. The third one is a lack of concentration and we were probably in a state of shock after what happened." Match ends, West Bromwich Albion 3, Hull City 2. Second Half ends, West Bromwich Albion 3, Hull City 2. Attempt missed. Jake Livermore (Hull City) header from the centre of the box is close, but misses to the left. Corner, Hull City. Conceded by Claudio Yacob. Substitution, Hull City. Sone Aluko replaces Robbie Brady. Goal! West Bromwich Albion 3, Hull City 2. Saido Berahino (West Bromwich Albion) left footed shot from the left side of the six yard box to the bottom right corner. Assisted by Silvestre Varela. Goal! West Bromwich Albion 2, Hull City 2. Gareth McAuley (West Bromwich Albion) right footed shot from the centre of the box to the bottom left corner following a corner. Corner, West Bromwich Albion. Conceded by James Chester. Attempt saved. Georgios Samaras (West Bromwich Albion) header from the right side of the box is saved in the top right corner. Attempt blocked. Sebastián Blanco (West Bromwich Albion) left footed shot from outside the box is blocked. Substitution, Hull City. Harry Maguire replaces David Meyler because of an injury. Corner, West Bromwich Albion. Conceded by Steve Harper. Attempt saved. Claudio Yacob (West Bromwich Albion) right footed shot from outside the box is saved in the top right corner. Hand ball by Jason Davidson (West Bromwich Albion). Substitution, West Bromwich Albion. Silvestre Varela replaces Youssuf Mulumbu. Dangerous play by Georgios Samaras (West Bromwich Albion). (Hull City) wins a free kick in the attacking half. Youssuf Mulumbu (West Bromwich Albion) wins a free kick on the right wing. Corner, West Bromwich Albion. Conceded by Paul McShane. Attempt saved. Robbie Brady (Hull City) right footed shot from outside the box is saved in the top centre of the goal. Cristian Gamboa (West Bromwich Albion) is shown the yellow card. Foul by Cristian Gamboa (West Bromwich Albion). Robbie Brady (Hull City) wins a free kick in the defensive half. Dangerous play by Youssuf Mulumbu (West Bromwich Albion). Robbie Brady (Hull City) wins a free kick in the attacking half. Yannick Sagbo (Hull City) wins a free kick in the defensive half. Attempt missed. Liam O'Neil (West Bromwich Albion) right footed shot from the right side of the box misses to the left. Corner, West Bromwich Albion. Conceded by Maynor Figueroa. Substitution, Hull City. Jake Livermore replaces Alex Bruce. Alex Bruce (Hull City) is shown the yellow card. Sebastián Blanco (West Bromwich Albion) wins a free kick in the defensive half. Attempt saved. Cristian Gamboa (West Bromwich Albion) right footed shot from outside the box is saved in the top right corner. Attempt blocked. Sebastián Blanco (West Bromwich Albion) right footed shot from outside the box is blocked.